The above shows the worry with your strategy here. Imagine we are in the one-game, three-bidder, p=5/8 case. In simultaneous bidding, you (using the appropriate mixed strategy) can guarantee 1/3 of the payout in expectation. If you move first and choose the favorite, then if 2 and 3 bid sequentially, you will get 5/16<1/3 of the payoff. If, alternatively, 2 and 3 move simultaneously after your announcement, they will mix symmetrically such that the payoff from taking the underdog and the favorite are identical; therefore if there is any mixing, the payoff from taking the favorite and the dog are equal, and since it is easy to show that mixing is optimal, all players earn payoff 1/3, giving no advantage to moving first. Suppose player 1 does not PUBLICLY declare his picks, but instead privately shows them to the other two players — AND is able to hide the fact that he has done so. I think this is how a single player can really increase the chances of winning. Pulling off such information manipulation may be difficult. However, player 1 could also show ONLY player 2 his picks, and not tell player 3 about any of this. I think this too would help player 1. So Jeff, who is the sucker now? Great post, but I have a question: if Jeff’s department’s tournament were not a play-money one but a real-money competition (pennies instead of points, or better yet, dollars instead of pennies), that is, if one could stand to gain up to $1000 USD, would this change Jeff’s strategy of play? (I am not asking Jeff himself, since he will say “no” — I am asking everyone else.) As I see it, Jeff has chosen this unorthodox strategy not because he really wants to win his dept’s tournament, but because he wants to signal his problem-solving skills of his level of cleverness, which is fine, and since real money is not on the line, his strategy is certainly worth a try. Are you winning right now? LaSalle, Harvard, Ole Miss, and FGCU must have all given you a lot of points. Okla, AZ, and Memphis all look like they have decent chance at Elite Eight, which would give you even more points. And then at that point I assume you’re rooting for a #1 seed to win it all. I believe I am far ahead of the field, there should be an update tonight when this round is over. 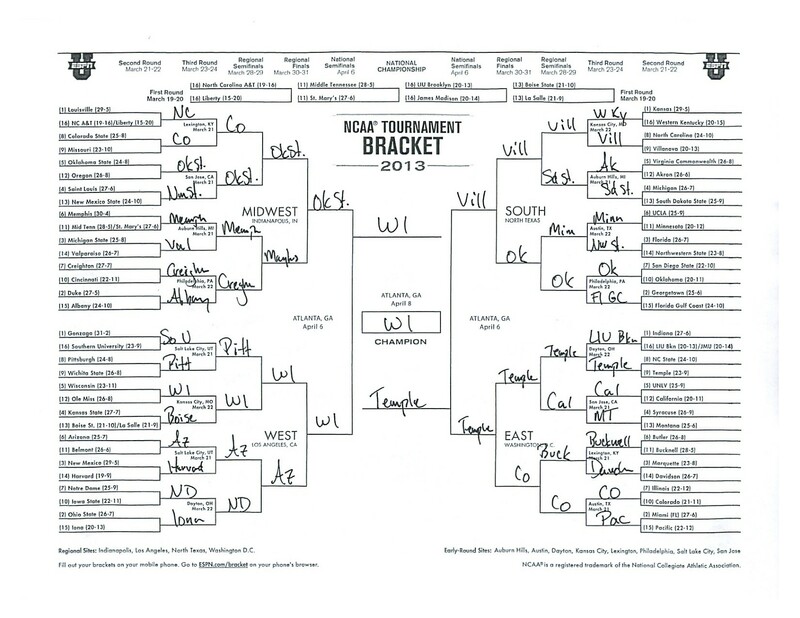 I was the only one to pick LaSalle, Harvard and FGCU. Should have had a friend enter a shill bracket.